With most vacations, we expect to come back feeling refreshed, rejuvenated and renewed. But throw in flight delays and lost luggage, and your relaxing vacation quickly becomes a stressful nightmare. As you plan your next getaway, how about going somewhere that specializes in tranquility? The locales listed here offer gorgeous landscapes, top-notch amenities and healing for the mind, body and soul. Sitting 22 miles from the nearest town and set within an 1,800-acre private, natural environment, Wilbur Hot Springs is a sanctuary where people go to heal and for healthy recreation. What to expect: Explore the grounds while hiking, biking or sitting and soaking it all in. And be ready to socialize—guests bring their own food, cook in a commercial kitchen and dine in the community dining room. Why you should go: With the slogan, "In all the world no waters like these,” the healing waters are therapeutic from head to toe. Other amenities include massage, acupuncture, acupressure and sound therapy. Programs: Guests have their choice of staying in a cabin, hotel room, private room, shared room or camping. Workshops, which are often complimentary for overnight guests, include “How to Open Your Natural Spiritual Abilities,” “Tai Chi on the Historic Red Bridge," and “Guest Chef Weekends” which brings renowned chefs in for three days of mouthwatering meals. Offering two-to-five-night meditation retreats, Silent Stay focuses on the healing presence of silence and nature. The programs combine daily meditation and meditative movement with spacious afternoons for walking, swimming and resting. What to expect: Located on a ridge top, you’re greeted with panoramic views and open night skies, says Co-Founder Ruth Davis. Guests meet twice daily for sitting meditation, then convene in the afternoons for moving meditation. Why you should go: “We teach people the joy of having nothing to do but rather to learn to just be,” she shares. Programs: Retreats are based on a nightly rate (two-night minimum stay) that includes the program. 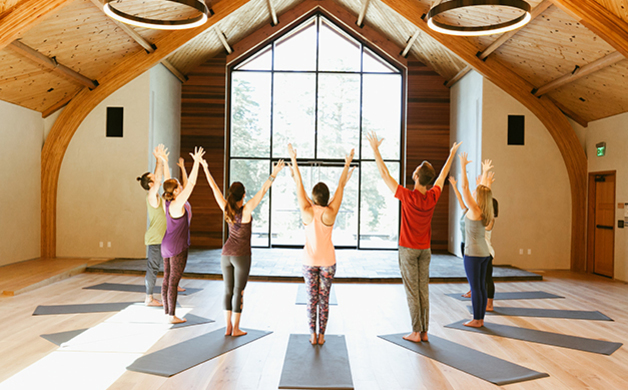 Named for the number of minutes in a day, 1440 Multiversity encourages guests to be present in each moment—a concept that proves difficult in everyday life. 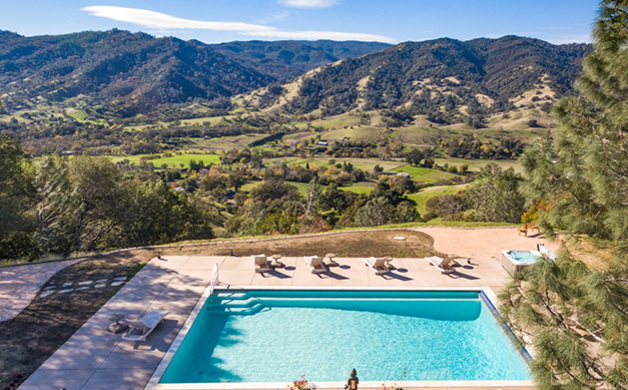 Why you should go: Amenities include complimentary morning yoga and tai chi classes, four miles of hiking trails in the oak and redwood forest, a fitness center, farm-to-table dining and access to the healing arts center, which includes holistic spa offerings and an outdoor infinity edge whirlpool overlooking 1,000-year-old redwood groves and hiking trails. Programs: Hundreds of programs are offered throughout the year, but popular ones include “Brave Magic,” a weekend with Elizabeth Gilbert and Cheryl Strayed; and “Applied Mindfulness,” a weeklong program with Sharon Salzburg and Judson Brewer, MD, PhD. According to Urban Dictionary, “glamping” is defined as luxury camping; in other words, getting to experience everything you love about the great outdoors—s’mores, stargazing and al fresco dining—without the backache. 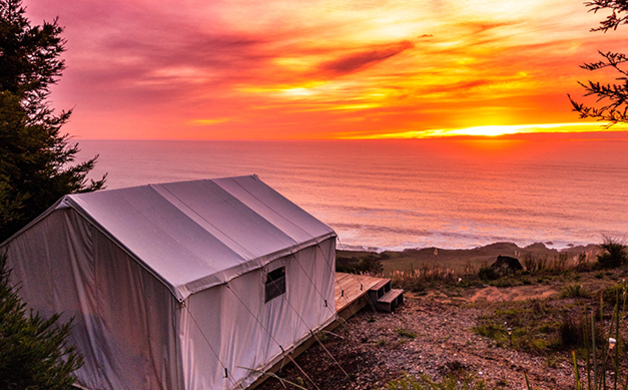 Perched on a bluff overlooking the Pacific, with 10 safari tents styled straight from Anthropologie (think tufted headboards, colorful rugs, memory foam mattresses, luxurious bedding and private porches), plus hot showers, flush toilets and an uber hip lounge “tent” complete with couches and games galore, Terra Glamping—nestled off Highway 1 near Sea Ranch—boasts all the amenities of a high-end hotel with nature (literally) at your doorstep. The lack of Wi-Fi ensures guests digitally detox and truly connect to their surrounds—and each other—while the communal kitchen provides all the dishware, spices and sauces needed to create a gourmet dinner. An included morning meal features the most sinfully decadent sticky buns, just-sweet (and cinnamon-y) enough granola, along with seasonal fruit, yogurt and pour-over coffee. If you detest discomfort but long to feed your need for nature, then Terra will make you a happy glamper indeed. 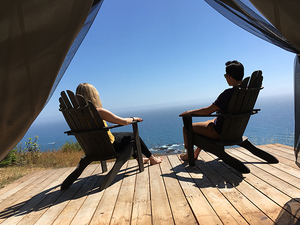 For more info and to book your stay, visit terraglamping.com. "We Tried It" bottom photo by Christopher Lim. Other photos courtesy of their respective companies or organizations.